Get a deeper look into what is driving your team and project profitability. Toggl Insights is a set of productivity tools designed to give you more details about the profitability of your projects and team members. The feature is available in Premium and Enterprise pricing plans. You can also test it during your 30-day free trial. Team page. Open the Team page, click on the down arrow next to the checkbox and select “Edit”. You can now define the Labor Cost and the Billable Rate for that user. Individual Project. Open a Project from the Projects page and click on the “Team” tab. You can now define the user’s Labor Cost and Billable Rate on the Project level. Useful tip: Insights will use the Project User Labor Cost when available. If the Labor Cost isn’t set for the Project User, it will utilize the Labor Cost set on the Team page. All of the reporting magic happens on the Insights page. To get accurate data, make sure you define the Labor Costs for your Workspace users. Your data will be displayed both in the graph and in the table directly below it. Insights data is largely static, however there are a few areas you can interact with. 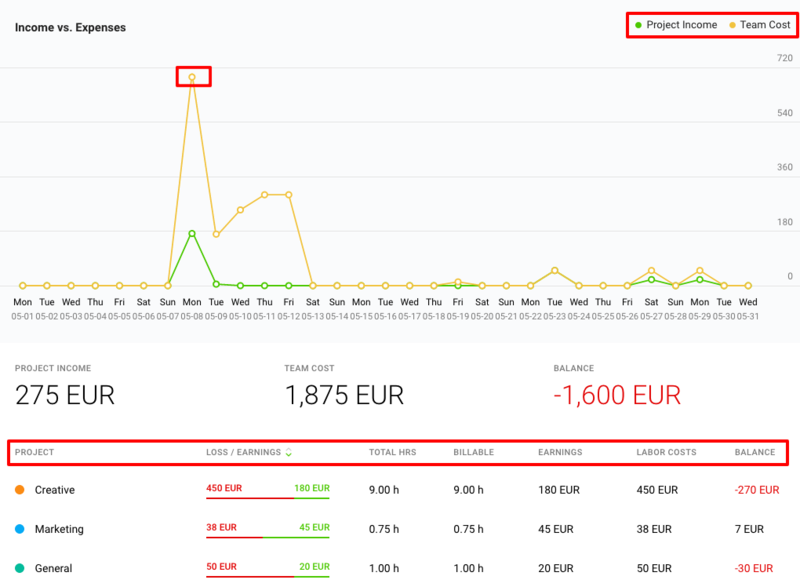 Hovering over Project Income and Team Cost will highlight the relevant bar in the graph. Hovering over specific points in the graph will reveal the exact cost and income on that point/day. Clicking on the headers in the table (Project, Loss/Earnings, etc) will allow you to sort data by that heading. Who has access to Insights? The Insights section can only be accessed by Workspace Administrators. Who can enter labor costs? Labor costs can be defined by Workspace Administrators and Project Managers. For details on how to provide Project Manager permissions, open this article. Can I assign Labor Costs to groups? No, this isn’t possible at the moment. Labor Costs must be assigned to individual team members, just like Billable rates. Why are my earnings and losses off? In most cases, it’s because the system isn’t applying the Billable or Labor Rate you think it’s applying. You can define Billable and Labor Rates on the project level and at the Workspace level.